I know that riverrun books intend to reissue this first novel from Elizabeth Lowry in the wake of the success of Dark Water. I presumptuously asked their senior publicist if I could go to the top of the list for a proof copy when they became available. Reader, I couldn’t wait! So I bought a copy. And I was nervous. I have placed Ms. Lowry on a literary pedestal because I am simply bewitched by her writing and I simply couldn’t have borne it if the novel hadn’t satisfied me even half as much as Dark Water. Hard to believe that this novel is ten years old but, like the paint on some of the fine art works that feature in the story, the words remain fresh and vibrant as if the ink was still wet on the page.And I apologise now if this turns into more of an essay than a review but, hey, it’s my damn blog and I’ll do what I want! Inevitable, because in some ways it’s subliminal, but as a reader I think you do forge comparisons between a writer’s works. 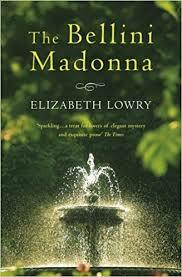 And whilst Dark Water and The Bellini Madonna appear to be very different books I found some recurring themes. But I will confess that I had read some reviews of this book immediately after I read Dark Water because I was desperate to find out more about this incredible novelist and I had hoped to find an extensive body of previous work that I could devour! I suppose that within the context of how many books I have waiting to be read and reviewed it is fortunate that Ms. Lowry has only produced this one, previous novel! Her writing is substantial, this is no frivolous beach read. You read the book and let it read you too. From what I researched I knew that comparisons had been offered with Nabokov, Henry James and Donna Tartt. That’s not a road I’m keen to travel down here other than to conjecture how much such lofty comparisons help or hinder an author. It must be complimentary but does that place a writer under pressure for subsequent work? And doesn’t the writing of any reader reflect their influences in some way? For me, anyway, she has a voice and style all of her own. Central to the narrative is the discovery in the old house, Mawle, of a diary that Thomas Lynch believes will guide him to the missing Bellini Madonna. The diary of James Roper last known owner of the picture. But let us consider Thomas Lynch. And whilst for the majority of the novel the reader is almost invited to despise him for, not least, his lascivious intent towards Anna, the redemption comes as a shock toward the end of the book when we realise that Lynch is doing the unthinkable and acknowledging his flaws and dysfunctions. ‘I stood at the edge of myself, looking into the cloven heart, not of Thomas Joseph Lynch, connoisseur and aesthete, but of a repulsive stranger. ….. I was a selfish, badly ageing man….’. But he’s a complicated man and as his history unfolds alongside the diary entries of James Roper we get the sense of history repeating itself, it’s as if Roper and Lynch are the same person. In the notes he makes whilst reading the diary at one point he refers to Roper as ‘I’ shocking himself even ‘did I really write I? `It’s as if in both cases ultimately predator becomes victim. It’s as if the two men’s stories unfold in parallel allowing Lynch to head towards his enlightenment. And if Dorian Gray has a deteriorating portrait in his attic James Roper’s portrait seems to have changed when Lynch takes another look in the latter stages of the book as if he were looking at a mirror and seeing the real person before him. And once done he seems to reject art. He ponders whether his encounter with emotion has destroyed his sense of the aesthetic. Cementing it all together is the sublime prose of Elizabeth Lowry. She is a sorceress of words and the spell she weaves has me reading huge chunks aloud for the immense pleasure of hearing the words and ideas resonate around me. It’s elegant, rich language. And she is so quotable! It’s a long while since I stopped so often whilst reading a book to marvel at the aphorisms twinkling throughout the pages of this story. These for example. i’m seriously erring on the side of sycophant and fangirl here so I’ll try and level things up with a touch of objectivity. For there were times when I felt confused between times frames and locations. But then again I wonder whether the uneven pacing mirrored the narrator’s uneven state of mind? And from the sublime to the absurdly ridiculous I found myself thinking of that sitcom ‘Allo ‘Allo’ and Officer Crabtree finding his ‘bust’ clue about The Fallen Madonna with the ’Bog Beebies’ !! And if you haven’t the faintest idea what I’m talking about, it is maybe because I am old and you are not!